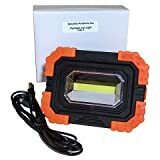 Portable Job Light by Sensible ProductsPortable Job Light # PJL-1 , The Sensible Products Portable Job Light (PJL-1) Portable Job Light…This lightweight Job Light is MAGNETIC , PORTABLE , CORDLESS , DURABLE! A necessity for your service vehicle , home , car , camaper , boat or anywhere portable light is needed. Looking for something else…let us know , we offer the widest variety of HVAC/R Solutions!